A wide range of beverages at the touch of a button. 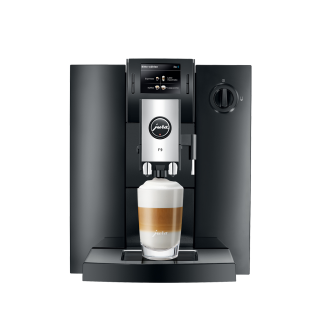 The JURA F9 is the first in the range to create your favourite speciality drinks with just the touch of a button. One touch and you are served a choice of speciality hot drinks, from latte macchiato to the popular flat white. Oversea authenticity and first choice quality every time; whatever your favourite. Whether it’s your morning fuel, or late night engine, with a menu boasting 14 quality speciality blends, the JURA F9 has a blend for everyone. Eight aroma levels allow you to customise your coffee break experience. While, individual spouts for coffee, milk and hot water maintain total, TÜV-certified hygiene, always. JURA’s TFT LCD technology with rotary selection make the JURA F9 user-friendly and time efficient. Simply turn the Rotary Switch to display a list of speciality coffees on the F9’s 2, 8” display. Four blends can be individually programmed on the start screen and given any name. Personalise to your taste. By perfecting the cutting angle the Aroma+ grinder is now twice as fast, improving efficiency significantly. We know you’re busy, and now the perfect aroma can now be reached in half the grinding time. That’s more aromatic coffee, more often. The JURA F9’s dual spout with fine foam technology means a perfect coffee indulgence every time. An airy and light milk foam with a perfect consistency make the ideal cappuccino or latte, guaranteeing you the perfect coffee moment, again and again.